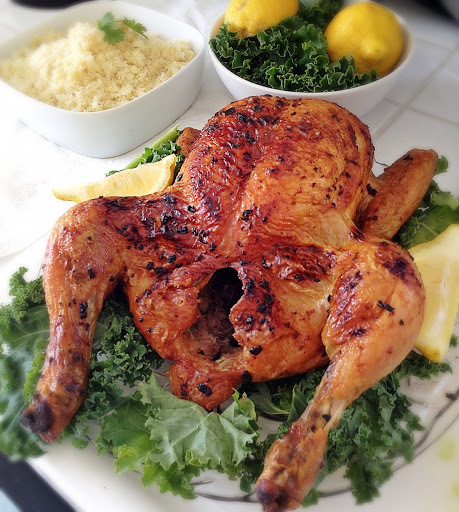 How to roast chicken-Steps to making the perfect roast chicken everytime! Roasted chicken is universal. 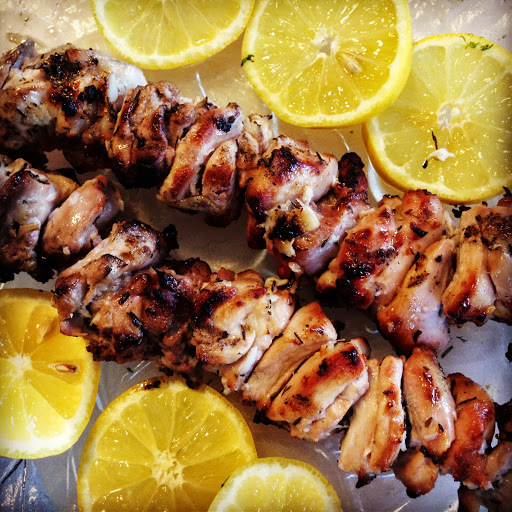 Almost every culture has some version of roasted chicken in their culinary history. However, as universal as roast chicken is, many still have a hard time making it. Just yesterday someone I follow posted a before and after picture of a roast chicken on Instagram. The bird was pasty before it went in the oven, and the bird was still pasty after it came out of the oven. I felt bad for this Instagramer because I’ve been there. The truth is that roasting a bird perfectly begins with steps that are made long before the bird goes in the oven. If you master these steps, I guarantee you that your roast chickens will come out of the oven, perfectly marinated, juicy and with a skin that is crackling and golden brown. Step 1. Pick the right chicken! Organic, non GMO, and air chilled is the way to go! Why? Because conventional chickens are stored in salt water to plump them up before you buy them. A water logged chicken can taste good, but it will likely be harder to get a crispy crust on a water logged chicken, than one that is not water logged. Note: Read the label on the chicken, most chickens in the supermarket have up to 4% retained water because they are dropped in a 34 degree chlorinated water bath before they are sold. Air chilled chickens are not exposed to water, so getting a crisp skin on an air chilled chicken is easier. Step 2. Brining! Most of you are probably thinking, “but you just said not to buy a water logged chicken, now you’re telling me to brine it? !” I said it, and I meant it! There are other ways to brine without water. Salt brining. This will change your life! Salt brining literally is what it sounds like, you thoroughly salt the chicken, put it in a Zip-Loc and let it sit over night. Salt does two things, it retains moisture and it pulls out moisture. This is a wonderful thing for a small bird like a chicken, because it doesn’t take longer than an hour to cook, so the amount of moisture it looses because of the salt brine is not significant enough for it to dry out. But it pulls out just enough moisture on the surface of the bird to make the skin crisp. At the same time it breaks down the protein, which means moist, tender, and well seasoned chicken! Step 3. The skin needs to be rubbed with oil, not butter. Although butter tastes great, it contains 16-18% water and 80% fat. Water is an enemy to getting perfectly crispy skin on a roast chicken. If you want to use butter to flavor your chicken, then by all means do so. Just make sure to put the butter where it will do the most good..under the skin in the breast bone. If you want crisp brown skin, use oil, it does not contain water, it is 100% fat, so it will result in a chicken that is so beautifully brown, you may not want to cut it…note I said may not, after you get a whiff of the this delicious chicken all bets are off. Step 4. Bake on a high temperature from the start. Most people reverse bake roast chickens, meaning they bake at a lower temperature for a longer period of time so the chicken doesn’t dry out, and then blast it at the end on a higher temp in hopes of browning the skin. Seems plausible enough but results are often not consistent. Take my advice, bake your chicken on 450 degrees farenheight for 45 minutes to 1 hour, your chicken will come out perfect every time. 1.5 tablespoons of Sea salt or kosher salt for every 1 pound bird. Sprinkle the salt all over the bird, place in a large bag and let sit over night. 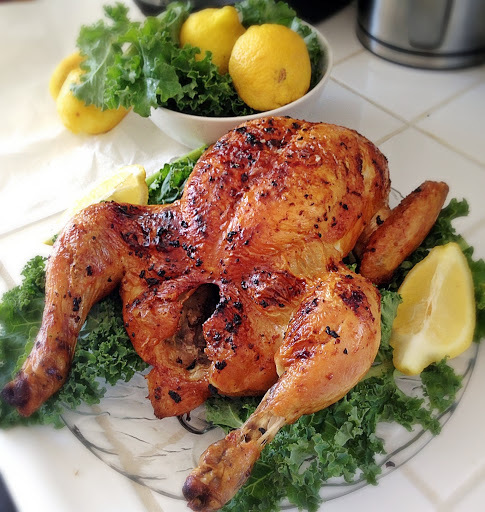 When your ready to cook it, add the oil and any herb you want–rub with a little garlic, bake it for 45 minutes to one hour, and Wah-La perfectly roasted chicken! This entry was posted in dinner, Food, Food blog, gluten free, Healthy Whole Food Blog, low calorie, low carb, paleo, quick fix meals, recipes and tagged brining chicken, brining meat, brining turkey, chicken recipes, Food, how to bake chicken, how to brine, how to brine a chicken, How to roast chicken, how to season chicken, recipe, recipes, reverse bake, Roast chicken, salt brine, salt bringing, thanksgiving recipes. Bookmark the permalink. Reblogged this on Lazy Girl Dinners.